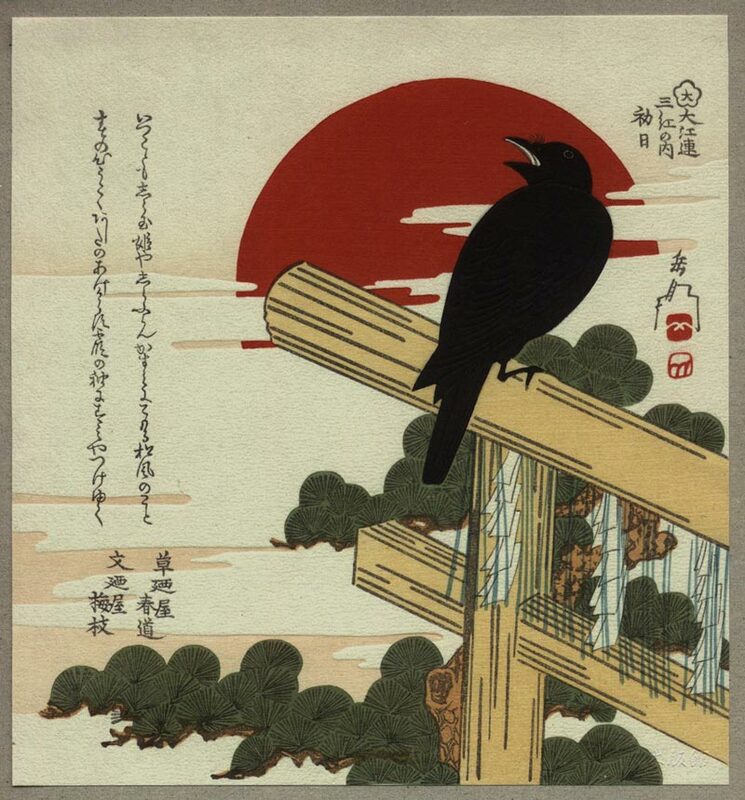 Description: This is a reproduction of one of the prints known as 'Akashi-ban' surimono. In the early 1890's an enterprising publisher in Akashi, near Kobe, issued many dozens of prints based on Edo period surimono (privately published prints). Scholars believe that these prints were targeted at the foreign market, as relatively few of them are found in Japan these days, while they commonly turn up in Europe (Kobe was one of the areas first opened up to foreign settlement). They are wonderfully made, with superbly carved calligraphy and well-executed printing. 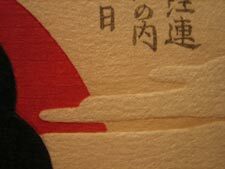 They differ from the originals on which they were based chiefly in the paper; most surimono originals are printed on paper with very weak sizing, if any. This reproduction is as close to an exact copy of the Akashi version as is possible to make. 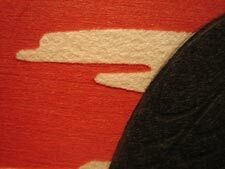 Dave cut the blocks in late 1998, and pulled a small number of copies which were given to guests at the final exhibition of his 10-year Hyakunin Isshu printmaking project. These Mokuhankan prints are now being pulled from the same blocks by the Mokuhankan staff. 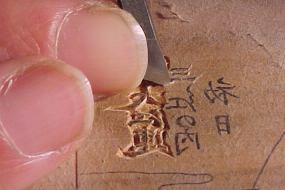 The blocks are Japanese cherry, but utilize boxwood inserts for the areas of delicate calligraphy. A 'photo-essay' showing how this print was made can be seen here on Dave's website. 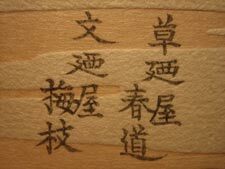 Content: Gakutei would have been commissioned to produce his design by members of the Osaka poetry group mentioned in the calligraphy at the top right - 'Oeren' (literally: 'large red group). This is one of a series of three designs based on the colour red, and is entitled 'First sun', a reference to the first sunrise of the New Year. I don't know where she is, but I can hear Princess Shira-tama playing the pine tree harp in the spring haze. Spring has come, and the east wind blows and shakes the flowers. 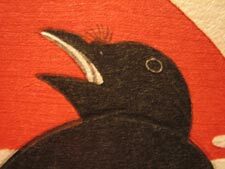 As the new year dawns, a crow caws, and flies to its nest. 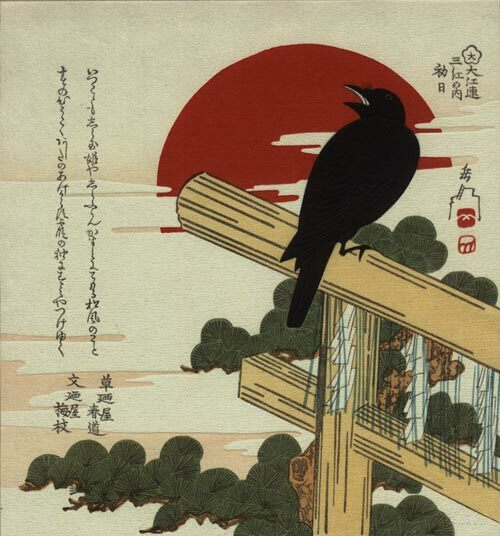 It looks like Spring is wearing the clothes of spring haze and the flying crow looks like spots of haze on its sleeve.